Front doors are one of the best ways to make an investment to your curb appeal, due to their relatively low investment and high ROI. For front doors, bright colors can have a great impact on home value, because they cause your home to stand out. One thing that you want to make sure is that your front door contrasts, but doesn’t clash with the rest of your home’s exterior. Studies have shown that navy blue and charcoal front doors, on average, have the most positive effect on home values. Dining rooms are where families and friends come together to share food and conversation. As such, it’s important that the colors in dining rooms aren’t too drab, but also so that they don’t overtake the energy in the room. Again, navy blue and pale blue were heavy hitters, and could potentially raise a home’s value by nearly $2,000 on average. Light browns tended to have the best effect on living rooms, and could increase a home’s value by more than $1,800 on average. 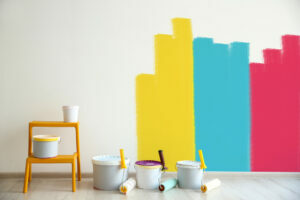 Surprisingly, living rooms are one of the few places where shades of blue had a negative impact on home value, especially light blue colors, which could potentially lower a home’s value by around $800. Bathrooms have a major impact on home value. People like to be comfortable in such a vulnerable place. Periwinkle and light blue were heavy hitters, in terms of bathroom’s effect on home value. The biggest thing to note, though, is that white bathrooms were viewed very negatively, and could lower a home’s value by more than $4,000!